The bomb should definitely work with Blastmaster Boom. Play 2 sound is like some ceremonial entry, niiiice! 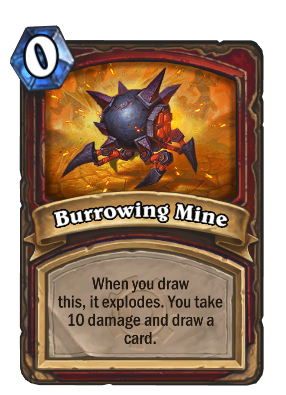 Wow, it took me waaaay too long to find out that the reason the mines now cost 6 instead of 0 isn't a bug, but just a way for players with Hemet, Jungle Hunter not to ruin your plans. Nifty! As expected, this is still awesome. I love this card. I try to fit it in all of my Warrior Decks! Works great in C'Thun and N'Zoth, the Corruptor decks where you're already using Brann Bronzebeard and 1 copy of Dead Man's Hand. Functions as an alternate win condition against decks with a lot of card draw and if you need an additional big push to beat some control decks you can put up to 4 mines in their deck with a full Brann Bronzebeard and Dead Man's Hand combo. What a beautiful card for fatigue warrior! Aww, I fell in love with this card ever since it won me a game thanks to Unstable Portal. If only I had enough dust at the time to get him. 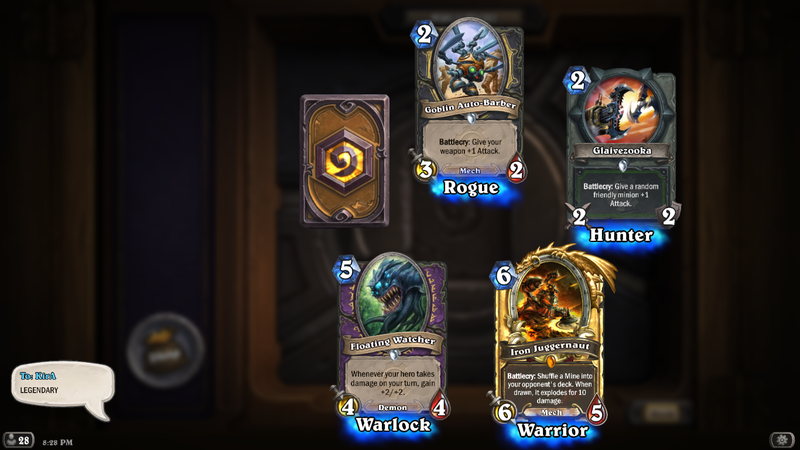 Or if I had opened him instead of Flame Leviathan. I think the saddest part is that this card didn't even see that much play. If it was some hideous, and obviously OP auto-include, then I'd probably not feel too bad to know that I got by without him. But he wasn't. And when he did work, it made games intense. Even against him, drawing cards had never been so exciting. Really love this card. The art, the feel of the ticking time bomb when it's dropped. Will miss it in Standard. Never got to see the Iron Juggernaut interaction, but I played against a mage who Duplicated his Elise Starseeker and got 3 Maps to the Golden Monkey. after getting the first monkey out he still drew into the other 2 maps. Maybe un-collectible cards will be unchanged, not sure yet tho. It might be too late to reply to your question, but once, a warrior planted two mines with the help of Brann Bronzebeard. After detonating one, I was able to get the monkey down, and the second mine never showed up. I assume its only maps that don't get turned into legendaries, because my excavated evils and roaring torches also turn into leggies when the monkey comes out. Kinda wish I had one to try with Brann for a heart-attack Fatigue Warrior. Doubt it's super viable, but it would be totally worth it to see those mines detonating. A 6 mana 6/5 battlecry do 10 damage to the enemy hero is impressive. A 6 mana 6/5 is not. Which one will he be this game? Who knows? Impressive, how you stated that. The main problem I have with this card is that sometimes it doesn't pop. 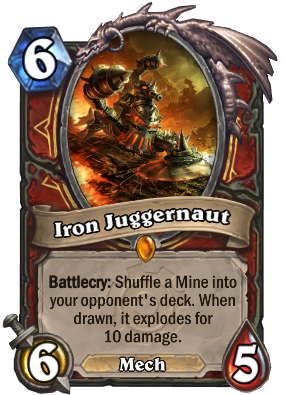 Potential of some sort of Fatigue/Mill Warrior in the future with more cards of the similar sort?